Posted on April 5, 2013 by Susan H.
My interest in Flapjacks stemmed from this great article that I read in the March 2010 issue of Bon Appetit Magazine titled, “bar none When is a flapjack not a pancake? When it is a delicious, buttery British cookie”, by Molly Wizenberg. I have to say, Molly’s article made me laugh. It made me recall my own memories of my trip to Europe with my best friend, at the age of 19. Michelle and I visited my Scottish relatives and over-indulged in all their tasty delicacies. Thank goodness for Pepto Bismol! More importantly, it reminded me of an oatmeal cookie. 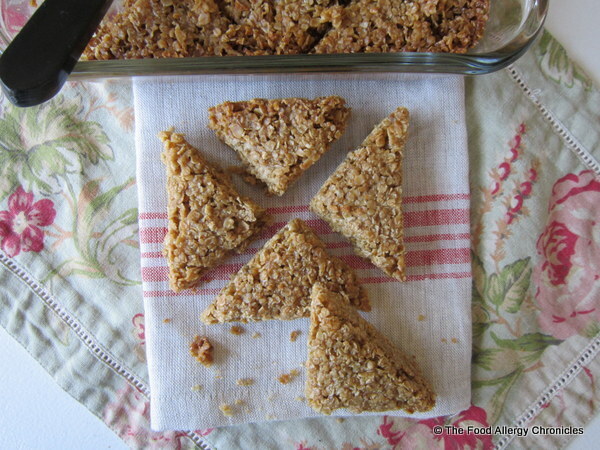 My Aunt Mary, in Scotland, is famous for her Oatmeal Cookies…could this have been a Flapjack? I quickly emailed my cousin who contacted his mother…I had the recipe the very same day. My Aunt Mary’s Oatmeal Cookie recipe turned out to be more of a cookie than a ‘flapjack square’. I tried it all the same and fell in love with the memory. Click here for my post on my adapted recipe for my Aunt Mary’s Oatmeal Cookie recipe. 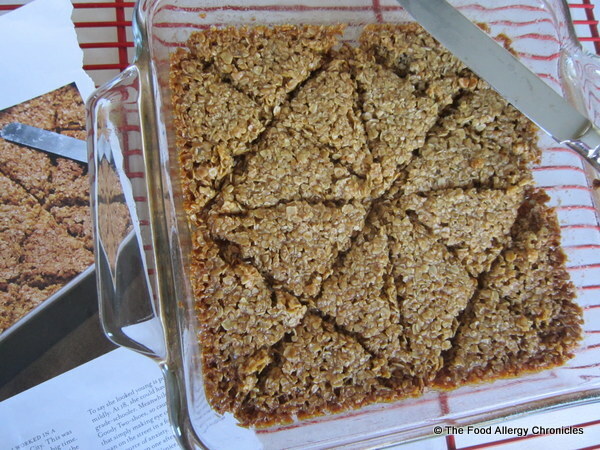 I had to adapt a batch of Molly’s British Flapjack recipe to compare…I replaced the butter with Earth Balance Vegan Buttery Sticks or for a soy free version use Earth Balance Soy Free Natural Buttery Spread. Molly is ‘bang on’! Both my Aunt Mary’s Oatmeal Cookie and Molly’s British Flapjack have that rich, toasty oat flavour that makes your mouth water. 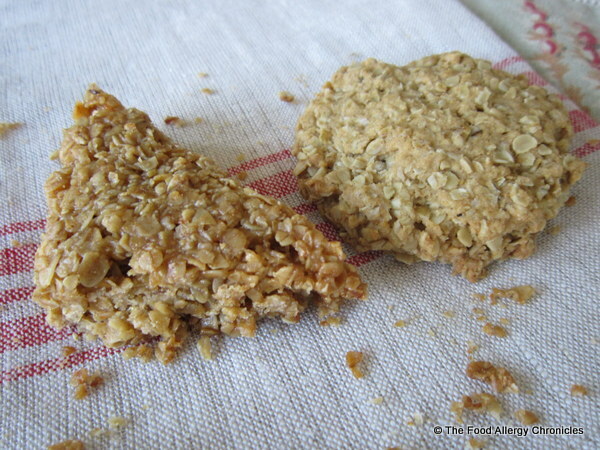 Whereas, the cookie is, well, more like a cookie…the flapjack has a slightly sweeter, candy like chew to it. Frankly, both are yummy and terribly addictive! Click here for the Molly’s original article and here for her original recipe. Tip 1: Molly’s British Flapjacks were a bit difficult to remove from the pan…might want to remove them soon after they have cooled and store in another container. Although, I did enjoy nibbling on all the bits stuck to the pan! Tip 2: I would love to try both my Aunt Mary’s Oatmeal Cookie and Molly’s British Flapjack using canola oil instead of Earth Balance. Tip 3: Oat flour would make for an even ‘oatier’ taste and texture in my Aunt Mary’s Oatmeal Cookie. Tip 4: Both my Aunt Mary’s Oatmeal Cookie and Molly’s British Flapjack could be gluten-free using gluten-free oats, flour or oat flour. Tip 5: Lyle’s Golden Syrup is a British staple…many would say it is irreplaceable in both my Aunt Mary’s Oatmeal Cookies and in Molly’s British Flapjacks. This entry was posted in allergies, baking, cookies, dairy free, egg free, multiple food allergies, oats, peanut/tree nut free, Snacks, soy free, squares and tagged Dairy Egg Soy and Peanut/Tree Nut Free Flapjacks, Dairy Egg Soy and Peanut/Tree Nut Free Oatmeal 'Flapjack' Cookies, Earth Balance Soy Free Natural Buttery Spread, Earth Balance Vegan Buttery Sticks, Lyle's Golden Syrup by Susan H.. Bookmark the permalink. mmm, they look like good n proper flapjacks!